Looking for the Confederate War: Going to Gettysburg? Several people have asked, but no, I'm not going to either of the Gettysburg reenactments. Been there and done that - twice. I was at the 125th event in 1988, and the 135th event in 1998. The 1998 was the largest reenactment ever held - somewhere between 20,000 and 25,000 re-enactors. Since politics has dictated that we have two events this year, I seriously doubt we will eclipse the 1998 event. 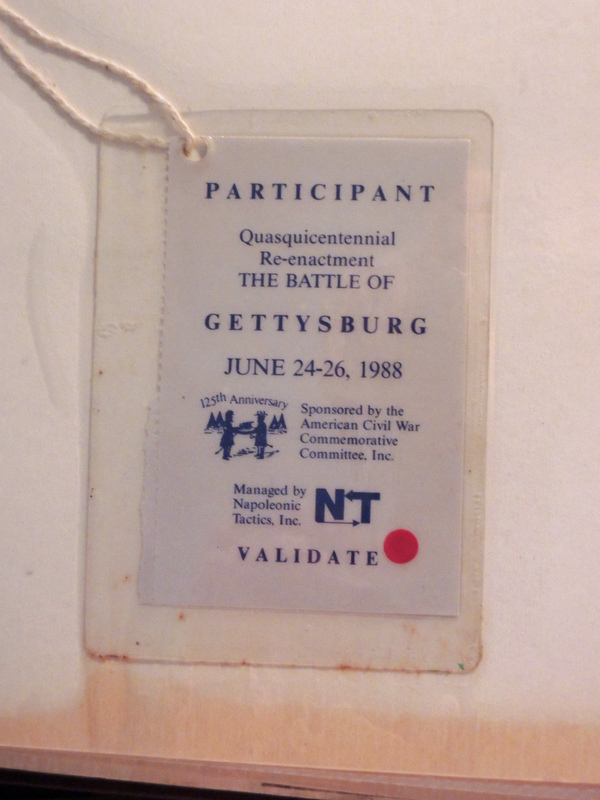 And, I swore after the Gettysburg event in 1998 that I would never go back for the event - too hot, too many people, too hot, and well, just too hot. To be very honest, the 2001 Manassas event ruined me - the heat index was around 115 degrees, and I've just not cared about any summer event outside the mountains since. So, what I will I spend the next week doing? Tomorrow, the Hardy family will be volunteering our time at the Zeb Vance Birthplace State Historic Site near Weaverville. We'll be talking about Civil War music and ladies' clothing (particularly undergarments, ever popular). Probably Sunday, Monday, and Tuesday, I'll work on finishing up the Watauga County and the Civil War manuscript and getting if off to the publisher. I might be doing a program for the National Park Service next Friday evening at the Linville Falls Campground on the Blue Ridge Parkway, and on Saturday, I'll be talking about the War at the Newland centennial celebration here in Avery County. Y'all enjoy Gettysburg. I skip the heat, ticks, $20+ bags of ice, traffic jams, and frequent thunderstorms. I'll just live in the past.... After all , there will be hordes of faceless folks at Gettysburg, but the Zeb Vance Birthplace really needs us and our friends to make their event happen. Sometimes, it is better to be where we are needed than at the "big (and did I mention hot?) show." The photo? 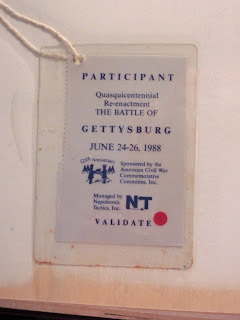 It is my registration badge from the 1988 event.